THE administration of Theodore Roosevelt was in some respects the first modern presidency. It is with Roosevelt that the most distinctive twentieth-century characteristics of the executive office emerged as more or less permanent traits. Roosevelt put the presidency and the federal government at the center of peacetime political action. He made the White House a national focus for the social mood and did much to set the moral tone of his times. He exploited the president's powers as commander in chief to initiate a forceful, independent foreign policy, deploying military forces abroad without direct (or any) consultation with Congress. And he extended presidential initiatives in policymaking to the domestic scene on an unprecedented scale, putting forward reform proposals for congressional action and using executive orders to promote major innovative programs. Not all the traits that Roosevelt brought to the White House were admirable. There was sometimes as much truculence as confidence, as much belligerence as goodwill, and as much bravado as good sense. He set some dubious precedents in his bullying of small nations and in his sometimes casual regard for constitutional and international law. He did much to prod Americans to take up their responsibilities as a powerful nation to use their power for good internationally, even though it must be said that his own conception of "good" could not always meet a test for universal approval. He was, in short, not the perfect model for the ideal Philosopher King. But his contributions to good government certainly outweighed his shortcomings. That Roosevelt went a long way toward persuading the nation of the legitimacy of federal responsibility for regulating business activities and husbanding the country's natural resources, unquestionably counts among his greatest contributions. By 1900, the corporate consolidation of the nation's business had greatly impaired the effectiveness of the market to allocate economic opportunities, advantages, and rewards equitably. Meanwhile, the predominantly interstate and global character of economic activity had rendered state governments constitutionally and administratively incapable of overseeing the nation's industrial and financial affairs so as to redress market imbalances. Nor had the states proved capable of controlling private exploitation of the public's mineral, timber, water, soil, scenic, and recreational resources, much of which by 1900 were beginning their way toward extinction. A longtime governmental vacuum awaited federal attention, which, given the parochial roots of congressional power, only the president could provide. The rise of "The Regulatory State" that gained much of its legitimacy during Roosevelt's presidency was as much an essential part of the modern political economy as was the emergence of the corporate form of business organization and the multinational business firm. Although in the final quarter of the century that began with the Age of Theodore Roosevelt a variety of economic interests came to use "deregulation" as an effective political slogan, in fact none of even those same interests truly envisioned a major withdrawal by the federal government of its regulatory role. Most of what went on in the politics of the 1880s and 1890s aimed chiefly at rearranging the structure of competitive costs and advantages that different business and other interests had constructed in previous decades. No one understood the vital importance of the modern regulatory state better than Theodore Roosevelt, and through all the political smoke of the 1890s it remained clear that his perceptions continued to serve modern government. Meanwhile, the competition for empire among the leading industrial and military powers of Europe and Asia challenged the rationale of America's traditional isolationism and forced heavy responsibilities on the country's commander in chief. These developments greatly magnified the importance of the presidency and inevitably drew the attention of the press beyond state and local events to national politics. Later in the century, as film, radio, and television became public media instruments, the presence of the chief executive and his family would become more potent and more influential. But Theodore Roosevelt achieved such stature in advance of the new technology. It may be that Americans generally get the president who most closely mirrors their mood, but it is at least arguable that presidents shape the nation's mood, its manners, its tastes, and its morals somewhat more than they have been shaped by them. This seems especially true of Theodore Roosevelt. The indispensable printed source is Elting E. Morison, John Morton Blum, and Alfred D. Chandler, Jr., eds., The Letters of Theodore Roosevelt , 8 vols. (Cambridge, Mass., 1951–1954); volumes 2, 4, 6, and 8 also contain perceptive essays by the editors. Henry Cabot Lodge, ed., Selections from the Correspondence of Theodore Roosevelt and Henry Cabot Lodge, 1884–1918 , 2 vols. (New York, 1925), is far more limited and purposefully edited, but useful nevertheless. John M. Blum, The Republican Roosevelt (Cambridge, Mass., 1954; 2d ed., 1977), is a masterful analysis of Roosevelt the man and the president. Blum's chapter on Roosevelt in his The Progressive Presidents: Roosevelt, Wilson, Roosevelt, Johnson (New York, 1980), fine-tunes the portrait. Morton Keller, ed., Theodore Roosevelt: A Profile (New York, 1967), contains sharply focused excerpts from a variety of books on Roosevelt himself and on the Progressive era. The best single biography remains William H. Harbaugh, Power and Responsibility: The Life and Times of Theodore Roosevelt (New York, 1961; rev. ed., 1975). But Lewis L. Gould, The Presidency of Theodore Roosevelt (Lawrence, Kans., 1991), provides more concentrated attention on the presidency than Harbaugh and more detail than the present article. For an account of the young T. R. see David McCullough, Mornings on Horseback (New York, 1981). All Roosevelt's biographers continue to be indebted to the keen insights and comprehensive research in Howard K. Beale, Theodore Roosevelt and the Rise of America to World Power (Baltimore, 1956), for an understanding of T. R.'s foreign policy. Richard H. Collin, Theodore Roosevelt's Caribbean: The Panama Canal, the Monroe Doctrine, and the Latin American Context (Baton Rouge, La., 1990), brings that part of the Roosevelt story in touch with more recent revisionist historiography. An important account of Roosevelt appears in John Milton Cooper, Jr., The Warrior and the Priest: Woodrow Wilson and Theodore Roosevelt (Cambridge, Mass., 1983), an excellent exercise in comparative biography. David H. Burton, The Learned Presidency: Theodore Roosevelt, William Howard Taft, Woodrow Wilson (Rutherford, N.J., 1988), treats the extraordinary succession of learned, even scholarly, presidents in that extraordinary era at the turn of the century when the well-earned credentials of intelligence were still important political assets. Arthur M. Schlesinger, Jr., The Imperial Presidency (Boston, 1973); George E. Reedy, The Twilight of the Presidency (New York, 1970); and Richard E. Neustadt's pioneering study Presidential Power , 2 vols. (Durham, N.C., 1976), deal with Roosevelt only in passing but will help put his presidency in historical perspective, as will James David Barber, The Presidential Character (Englewood Cliffs, N.J., 1972), which offers a theoretical framework for "predicting performance in the White House." George E. Mowry, The Era of Theodore Roosevelt, 1900–1912 (New York, 1958), remains one of the best accounts of T. R.'s administration within the context of the Progressive era. Richard M. Abrams, The Burdens of Progress: 1900–1929 (Glenview, Ill., 1978), provides a broader cultural and political context for understanding Roosevelt's personality and leadership. Robert H. Wiebe, "The House of Morgan and the Executive, 1905–1913," in American Historical Review 65 (1959), from which a part of the account of Roosevelt's consultations with Morgan was taken, should be supplemented by Wiebe, Businessmen and Reform: A Study of the Progressive Movement (Cambridge, Mass., 1962), while there is no better account of the conservation movement than Samuel P. Hays, Conservation and the Gospel of Efficiency: The Progressive Conservation Movement, 1890–1920 (Cambridge, Mass., 1959). Among the more recent works, Paul R. Cutright, Theodore Roosevelt: The Making of a Conservationist (Urbana, Ill., 1985), adds personal detail to the story that Hays treats with a broader brush. Recent works include Edmund Morris, Theodore Rex (New York, 2001), the second of a trilogy profiling the life of the president; this volume focuses on the presidency. The first volume of his early life is The Rise of Theodore Roosevelt (New York, 1979). See also Louis Auchincloss, Theodore Roosevelt (New York, 2001), H. W. Brands, T.R. : The Last Romantic (New York, 1997), and Nathan Miller, Theodore Roosevelt: A Life (1994). I love him! He is an amazing guy with an amazing heart. He will live on forever. He seems to have been a really colorful President (just like his cousin FDR). I wish another president in the future would have that same kind of colorfulness. I'm also doing a research project on his foreign policy right now and this web-page has been really helpful. 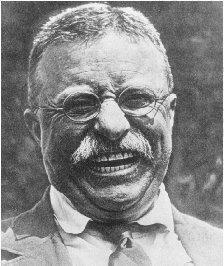 Theodore Roosevelt seemed like a facinating president that cared for his country and was whilling to take risks. Too bad we dont have presidents like him anymore because now all of them are scared or sumthing. Hopefully Obama could also be a great leader for this country.